Recently, I took my 3 year old niece to the zoo for her birthday. I say this in the full knowledge that most of the reason I took her to the zoo was so I got to go to the zoo. The zoo is the best! 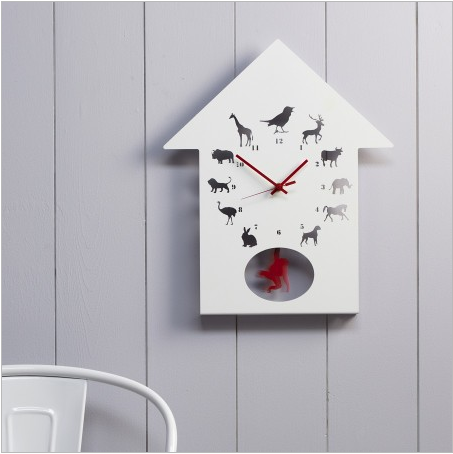 Now you know this (and are probably, quite rightly, judging me for being a bit of a selfish present-giver) you won't be surprised to learn how head over heels in love I am with the Clyde animal clock from Graham and Green. Every hour of the day has an animal attached. Oh, how I wish this was true for real life - a rabbit could come hopping by at 7, an elephant could march past at 3... okay, perhaps not really feasible, but it totally works in my head. From now on, elevenses shall be known as giraffeses, and I will sing "She gets too hungry for ostrich at eight". The possibilities for animal/time fusion is just too much. I suppose technically it's aimed at children (but then, so is the zoo), however I think it's actually really pretty, so I definitely wouldn't mind it adorning my kitchen wall. The slight downside is it's £79, which I think may be on the pricey side for what it is, BUT WAIT: it has a swinging monkey pendulum! Surely that's worth all of my money. Oh yes.